Birmingham has been challenging and developing great minds for more than a century. Characterised by a tradition of innovation, research at the university has broken new ground, pushed forward the boundaries of knowledge and made an impact on people’s lives. They continue this tradition today and have ambitions for a future that will embed our work and recognition of the Birmingham name on the international stage. The university is ranked amongst the world’s top 100 institutions; its work brings people from across the world to Birmingham, including researchers, teachers and more than 5,000 international students from nearly 150 countries. The University of Birmingham has been successful in attracting large numbers of Chevening Scholars to their programmes since the scheme’s inception. Who do the University of Birmingham support? The University of Birmingham generously co-fund a number of Chevening Awards open to applicants from any Chevening-eligible country to support any one-year taught master's programme at Birmingham. All applicants who wish to be considered for an award at Birmingham are encouraged to select Birmingham as their first preference within their Chevening application. 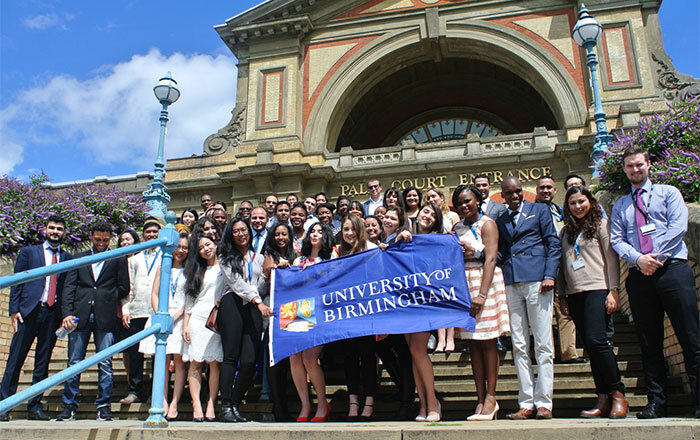 Pictured: Chevening Scholars who studied at the University of Birmingham in 2015/2016 at Alexandra Palace.